WHILST I’m a confirmed meat eater I’ve recently been dabbling with vegetarian meals. When we’ve had an excess of meat or rich foods, we like to have the odd non-meat dinner. We’re also aware that whilst we are happy omnivores, not everyone is. So here’s my latest veggie recipe. 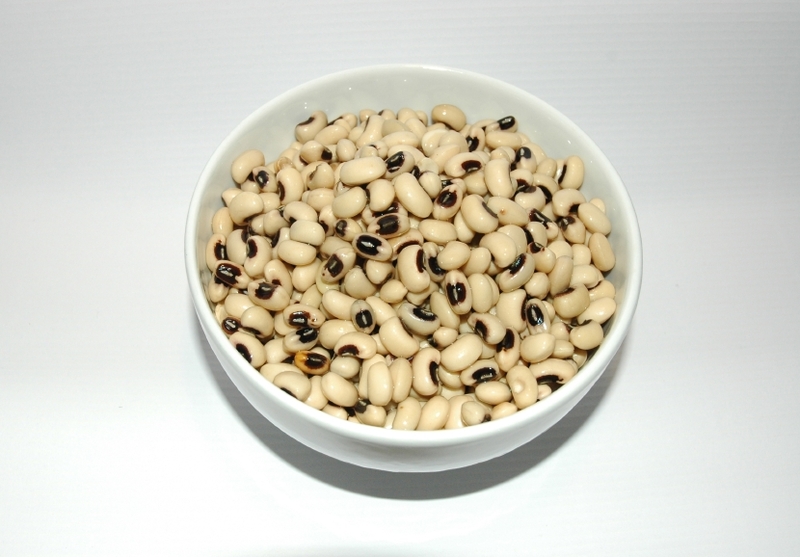 It appealed to me because I had some ripe plantains, so wanted a rice and bean dish to go with it but Chris’ mum’s African black eyed beans we had lurking in the freezer were way too spicy for my palate. This is sooooo quick (literally ten minutes to prepare and less than 30 minutes to cook) that it makes a great store cupboard, easy dinner and only requires a chopping board, knife and a tin opener. Plus the black eyed beans are really meaty. I used beef stock to meat it up (obviously veggies can use a non-meat equivalent). We aren’t dieticans or nutritionists so would always recommend if you are following a strict vegetarian or vegan diet, it’s really important for you to seek the advice of a nutritionist to ensure you are still getting enough amino acids, protein and fats into your diet. Fry the chopped onions in a pan with a slug of olive oil (be generous to add fats to this recipe) until soft and slightly coloured. Then add the chopped garlic and fry for a few minutes taking care not to catch the garlic. Make a space in the pan and add the tomato puree, cook it off then incorporate. Add all the dry spices (to your taste) and cook for another few minutes. Add the tomatoes and stock cube plus a little water (rinse out the tomato tin) then bring to a simmer. Season well with salt and lots of black pepper. Add the beans and chickpeas if using and cook for around 20 minutes, or until the beans are looking a little soft. You can add more water if it’s a little dry for you. Once you’ve finished cooking add the balsamic vinegar to taste. It brings out the flavour. Serve for dinner with steamed rice, fried plantains and a green salad with avocado (extra fats) or this is also great for lunch with a baked sweet potato.